I have recently set up Wagtail for a simple blog. Wagtail is bulit on top of Django and uses many of the same features, but there are a few differences in the way you use it, so I thought it was worth writing it down so other devs familiar with Django can get up to speed a bit quicker than I did. All the information is in the documentaion, but as there is quite a lot of it, hopefully this will save you some time. Pages are represented by Django models. The first and probably main concept that you need to know is that you have page types which are represented with PageModels in models.py. These are pretty similar to Django models, but inherit from the PageModel class rather than Django’s Model class. Each page has a set of fields which are standard Django model fields e.g. IntegerField, with a couple extra additions - RichTextField and StreamField for adding more complicated stuff than text and numbers. The top half (above “content_panels”) are all the fields - these get added as database fields when you run a migration. 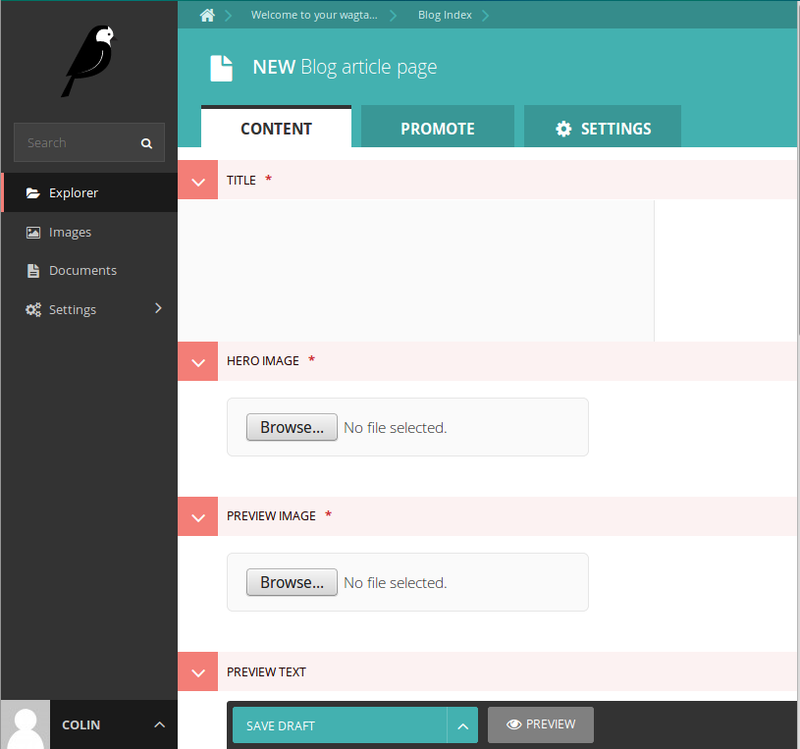 The content panels section is configuring the wagtail admin pages. So if you wanted to display the hero_image at the bottom of the admin page, you would have that as the last entry in the content_panels list rather than the first. Django view functions are done in models. I am used to using Django’s class based generic views for most stuff these days. It takes a lot of boilerplate out of the coding. But so far I haven’t used views.py and everything is handled for us automatically. So how do we get a list of blog articles to send to the template? We add a method get_context() to the PageModel and the queryset in there, which appears to be the equivalent of get_context_data() in Django’s class based views. I haven’t found out how to specify templates (yet). The default wagtail way of doing things is to use a template based on the name of the PageModel but with camel case converted to snake case. This is what my directory structure looks like, “blog” is Django app (jobsite is another Django app - all standard Django). In my models.py I have two main pages for the blog - BlogIndexPage and BlogArticlePage. So in the matchstaff/templates directory, I have a folder blog, with the tenplates in there. Based on the model names BlogIndexPage and BlogArticlePage, I have the templates in there named blog_index_page.html and blog_article_page. When editing a page, there is a tab “Promote Page”, which has a slug field that will be used for the url. It uses the tree structure (described below), so we would have blog/blog-article-slug for our blog posts. Now not using urls.py leads to some new problems. I added tagging to the blog articles so admins can add tags based on subjects and users can filter the list of blog articles on these tags. In this case we use a RoutablePageMixin. Now we want to filter the blog index on these tags. .. model definition here .. So the blog index is usually reached at http://ebsmatchstaff.com/blog/. 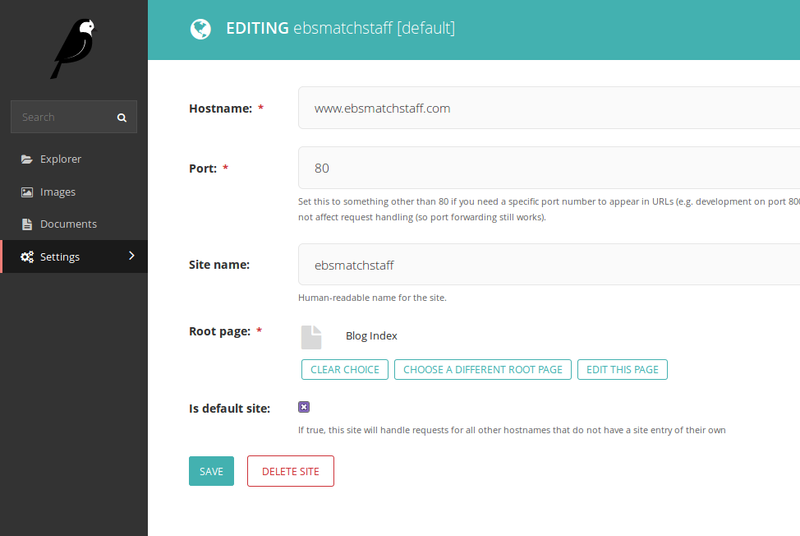 Now if we want to filter by tags, we add new routes to the url http://www.ebsmatchstaff.com/blog/tags/health/. 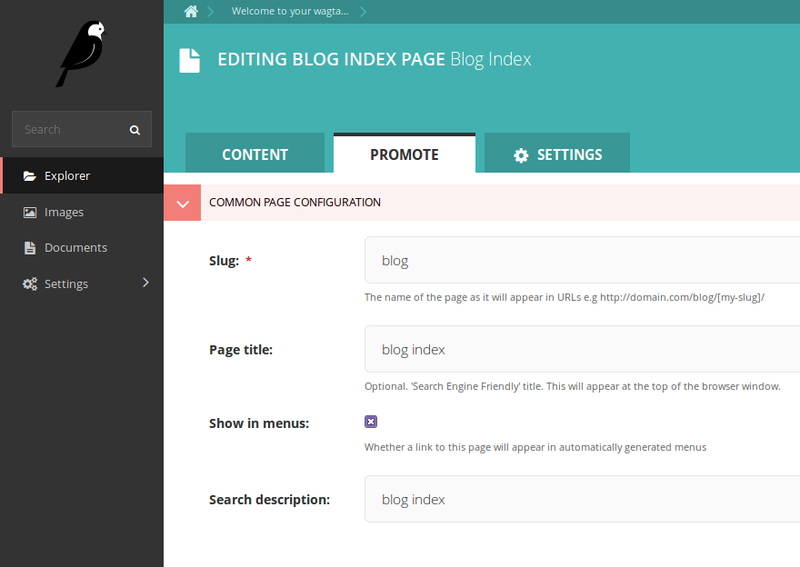 This will then use the tag archive function to return the blog posts filtered by the ‘health’ tag. This is the part that confused me the most, (especially as I had messed up my install and deleted the two default pages from the database). All Wagtail pages pages are part of a tree structure. When installing wagtail, it adds two default pages - “root” and a “welcome to wagtail” page. Everything is added as a child page of one of these. Wagtail doesn’t seem offer an option to add child pages to root, so all new pages end up being a child of “welcome to wagtail” (you can move the page to be a child of root afterwards, but you can’t add it there directly). But I don’t want “welcome to wagtail” as my top level page. That is fine. You need to set up a “site” to get everything up and running, and here you can specify your top level page for the site. So everything is in a tree structure, but your default page can be as far down the heirarchy as you want it. So thats what I have learned getting a blog up and running in Wagtaill. Looking at the docs, I only seemed to have scratched the surface and it seems like a decent CMS system.